I recently decided to re-build Interactive Palette’s (our web design agency) website and switch it over to WordPress. And I decided to exclusively use WordPress to design websites for small businesses now. That’s a lot of change in a small amount of time! What happened? After so many years of designing websites, why switch everything over to WordPress? I’ve been building and designing websites for small businesses since 1998. That’s the equivalent of probably sixty years in other vocations. Why? This industry moves incredibly fast. The rapid growth of website technology, software, hosting and different management platforms are unparalleled. Every day, hundreds (even thousands) of new tools are created for online experiences. Websites are constantly evolving. Consumers’ needs constantly change. And small businesses — now more than ever — need to meet their customers online with compelling experiences and persuasive brand messaging. I’ve used nearly every website platform under the sun. And without a single doubt, I’ve concluded that WordPress is the best website platform for small business. Maybe every business. If you’re a small business owner who’s considering different platforms to build your site, I’d like to explain my argument so you can make the right decision. Here are my top reasons to choose WordPress…. WordPress, unlike other website platforms, is set-up for SEO success right out of the box. WordPress creates easy-to-understand HTML pages that Google can scroll and index properly for its search engine. People often assume that small business websites are simple and straightforward. They all have five core pages and that’s it — Home, About Us, Services, Portfolio and Contact. In reality, these websites are just like any other: they all have different needs. And some require extensive customizations that web platforms like Wix or Squarespace can’t handle. WordPress, on the other hand, is an open-source software. It’s completely customizable. We can build websites for clients any way they want it. And because WordPress has such a large community of developers (we’re talking millions), most of these customizations are readily available as plug-ins. Actually writing the code for a customized application is a rare occasion when using this web platform. Instead of tinkering with clunky website builders or sticking within “cookie-cutter” themes, WordPress gives us the freedom to meet client’s wishes and design beautiful, user-friendly websites. 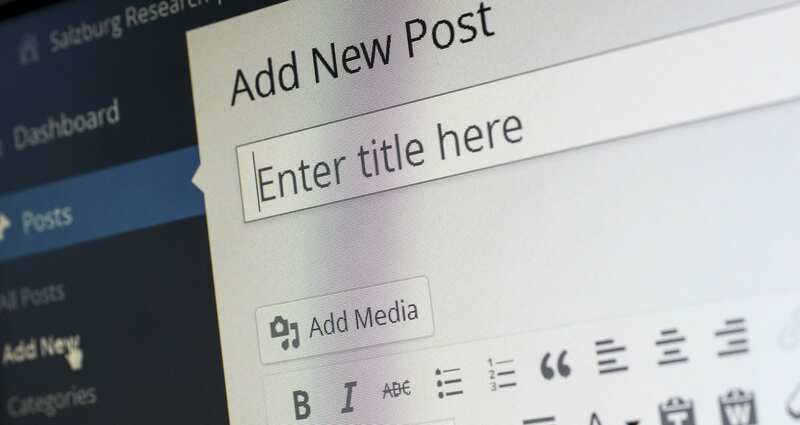 Fun fact: one in every four websites on the planet are created using WordPress. Yes, you read that correctly — that’s twenty-five percent on the entire world’s websites. Not only is WordPress the best website platform for small business, it’s also the best platform period. And because WordPress is an open-source platform, no one officially “owns it.” It’s a tool that is constantly updated, added to, and improved by a community of millions. The talent pool is endless. As a small business owner, you can rely on finding talented designers, developers and product developers at the drop of a hat. And those resources only continue to grow year after year. Plus, the platform is constantly improved to keep up with the latest needs of users. And security is a major priority. This last point ties in all the others. As you probably know, mobile browsing is incredibly popular. In fact, mobile browsing has officially eclipsed desktop browsing and continues to grow every year. What does that mean for us business owners? Websites must be accessible and intelligently designed for mobile devices and tablets. There’s no way around this. In fact, not having a mobile-responsive website could hurt your SEO rankings in Google and other major search engines. The good news? WordPress makes mobile optimization easy. Almost every theme in WordPress is designed with mobile browsing as a top priority. And customizing mobile websites within WordPress is easier and more effective than other website platforms. Do you have questions about designing small business websites in WordPress? Feel free to shoot me an email at kmcnally@interactivepalette.com or check out our blog posts on the topic.